This set of 2 lamp posts are sized for perspective scenes. The large lamp measures 0.75" x 3.5", and the smaller one measures 0.625" x 3". 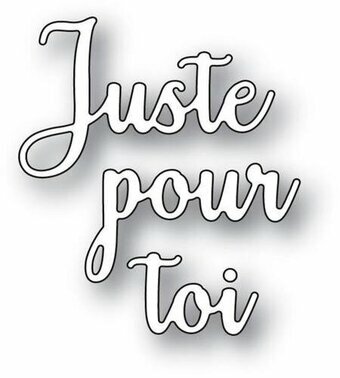 Craft die from Memory Box featuring the French phrase "Juste pour toi" meaning "just for you". Craft die featuring the Eiffel Tower, a penguin, and more. Memory Box/Poppy Stamps craft dies are made of 100% steel. For use on cardstock, felt, and fabric. Cut, stencil, emboss, create! Use in most leading die cut systems. 4 dies included. 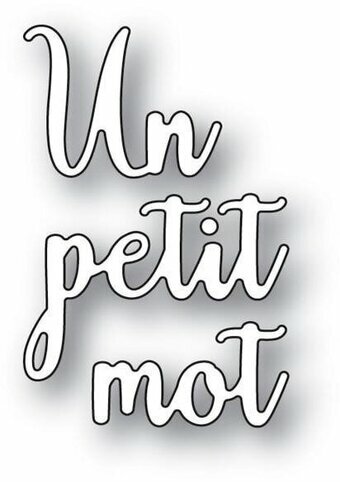 Craft die from Memory Box featuring the French phrase "de nous tous" meaning "from all of us". This Die-namics coordinates with the In Paris stamp set for perfectly sized die cuts every time. It is open inside to allow you to stamp then cut OR cut then stamp. This feature makes the Die-namics lighter weight and allows for easier removal from the die. This 8 piece set includes: Eiffel Tower 1 7/8" x 3 5/8", Building 1 1/8" x 2 3/8", Balloons (2) 1 1/4" x 2", 1" x 1 5/8", Bike 1 3/8" x 1 1/8", Tree 3/4" x 1 1/4", Dog 1 1/2" x 1 1/8", Heart trio 1/2" x 5/8". MFT Die-namics dies are our very own EXCLUSIVE, American made line of steel dies. These Card Creator French Flair Etched Dies from the Rouge Royale Deux Collection by Stacey Caron is a two piece die set, perfect for many types of projects. Use just the insert die to create an inset pattern into a project. Or nest the frame and insert dies to create an intricate die cut piece. Spellbinders Nestabilities Card Creator brings a simple and unique solution to multiple crafting projects. The work is all done for you, no more measuring required. Simply Choose your design, Assemble your pieces, Refine the details and you're Done! Spellbinders Founder and President, Stacey Caron, built on her popular Rouge Royale line to bring your projects to the next level with her Rouge Royale Deux Collection. Approximate Size: Frame: 5.85 x 5.85 in, Insert: 5.60 x 5.60 in. Beautiful and majestic, the Eiffel Tower is the most recognizable building in the world. This die measures 2" x 4". Shape Die - French Joyeux Noel. French sentiment die for Christmas cards and layouts. Includes an outer die to add layers to the sentiment. 4 dies. Sizes: Joyeaux: 2.25" x 0.90", Noel: 1.60" x 0.75". This precision die set coordinates with the Paris Bonjour Cling Stamp Set. 6 dies includes large fleur de lis. Eiffel Tower die measures approximately 4-3/4" X 2". Fleur De Lis measures approximately 2" X 2-1/4"
Scroll Banner Stamp & Die Set Ooh La La Collection by Stacey Caron brings both worlds together of die templates and coordinating stamps to give these images life! These cling foam (EVA) rubber stamps are designed to be used with an acrylic block. This set includes six stamps with one banner shape to frame your sentiment of choice. Ooh La La Collection by Stacey Caron has many elements that would be found if you were walking the streets of Paris - fleur de lis, scroll designs, flourish motifs and even the Eiffel Tower! Add them in your project for that French touch. Approximate Size: Banner Die: 4.70 x 1.80 in. 12.00 x 4.60 cm, Stamps: range from 0.70 x 0.30 in. 1.80 x 0.80 cm to 1.50 x 0.30 in. 3.80 x 0.80 cm.